Show off the Bling A two-toned manicure and an accent nail shows off your ring in a discreet way. These silver stripes are simply nail striping tape cut and laid across dry nails. Our favorite: Cina Silver Nail Striping Masking Tape. You go all out when it comes to searching for the perfect wedding dress. You tear out photo after photo of wedding updos, down 'dos and curly tendrils before deciding on the right hairstyle. And makeup artists -- forget it, you lost count. So why settle for a boring French manicure or simple pale pink polish on your wedding day? Your wedding nails should complement that gorgeous dress, show off your ring and of course, look great in the billions of photos you'll be posing for. 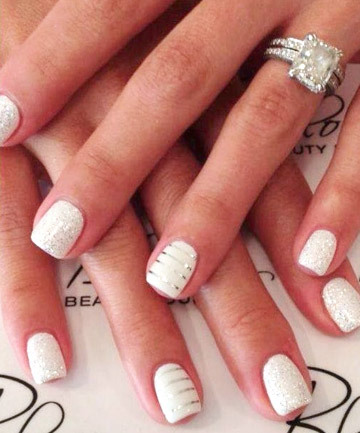 We scoured Pinterest and the nail art blogs for the best wedding nail designs and nail art ideas for your big day.